← Who will be the First to Catch the Wave? Various innovative online technologies can make this conversation happen. For grassroots journalists, what will be the most powerful gadget in the toolkit? In his book We the Media: Grassroots, Journalism by the People, For the People, Dan Gillmor discusses about journalism’s transformation from a 20th century mass media structure to something profoundly more grassroots and democratic. Gillmor asserts that “Tomorrow’s news reporting and production will be more of a conversation, or a seminar.” People who lead this infinite conversation, as he predicts, will be “grassroots journalists”, those who turned from readers to reporters publishing in real time to audience via the Internet. Gillmor expatiates on how blog can influence business entities and celebrities in the book. However, being a previous professional reporter and an enthusiastic blogger myself, I’m more interested in the following issues: will blog become a key constituent that redefines who journalists are? Will blog take place of Big Media and reshape our news reporting? Luckily, Gillmor elaborates some directions for us with a bunch of case studies. In the case of local community news, he encourages “’citizen-reporting’ by people who want to cover some broadly defined aspect of community life”, because Big Media can’t cover every single event going on. One way suggested is to invite members of the community to create blogs for that purpose. The websites of Big Media, in this case the newspaper, would monitor what’s been written and point from their sites to various blogs on these topics. This reminds me of my previous employer in China, a local news website. We host our own blog service. Every day, the blog editors will go through most of the posts, any one being a good supplement or as qualified as an official piece of news reporting will be picked out and reposted onto the news site. And the blogger will get paid for the article. In fact, many newspapers and TV stations are adopting the same policy by creating blogs on their online presence and collect resource from “citizen journalists”. Some of the Big Media, as Gillmor mentions in the book, even sell advertising on the blogs under the writers’ permission. It’s not difficult to see that blog, as representative form of participatory journalism, will take up considerable proportion in the future. “An audience that participated in the journalistic process is more demanding than passive consumers of news.” Gillmor’s words reassure the fact that the stereotype for “journalist” is no longer tenable. The era of grassroots journalism implies a broader of definition of journalist and a more flexible reader-oriented style of news reporting. According to an incomplete statistics, the amount of blog users worldwide has broken over 70 million. The number is still going, together with blog’s spin-offs. Sina.com, the largest Chinese web portal that takes lead in blog service, has launched Sina Weibo, a Chinese Microblogging site similar to Twitter in 2009. Now Weibo has more than 100 million users.Former audiences have substantially changed from mere consumers to active news creators. Yes, the trend is exciting, but it never saves pains on the shifting process. Are we losing credibility by adopting more multidirectional journalism? How can we tell trolls and spins from genuine posts among blog feeds? Gillmor also talks about the question of trust in this book. He believes that “no matter which tools and technologies we embrace, we must maintain core principles of journalism, including fairness, accuracy, and thoroughness. These are not afterthoughts. They are essential if professional journalism expects to survive.” I am in entire endorsement with Gillmor on this point. So I insist that editors are still needed when Big Media are pulling personal blog posts to their websites. They don’t necessarily need to be the “great fire wall” style filters or censors, but at least eligible for verifying the facts and looking for what’s missing in a story. And there is a new task for old journalists, as Gillmor reminds us, to help the growing amateurs understand and value ethics, the importance of serving the public trust, and professionalism. While for some high-profile blogs, reputation is not a problem, it’s also time for those bloggers to match depth to the content as professional journalists do. Apart from ethic issues, the force of government authority, centralization and legal restrictions are slowing the advances grassroots journalism’s made, for example, content censoring, even towards personal blog posts, is still applied in some countries. Gillmor believes the clampdown will finally be defeated by technology innovation and democratic development, to which I hold the same view. But I also suggest a moderate control on this “explosion of conversation” before it eventually gets ethically and legally mature, of course this is where it’s heading. Gillmor. D. (2004). 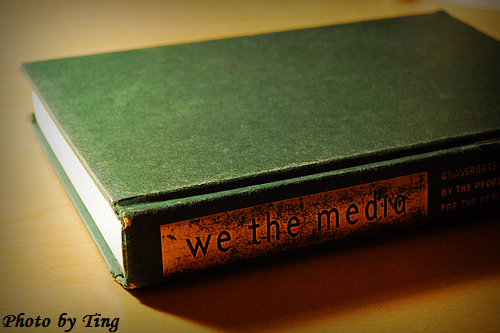 We the Media: Grassroots Journalism by the People, for the People. Sebastopol: O’Reilly Mdedia, Inc.